While we were in St. Petersburg (still my favorite city of all that I’ve seen in the world), we went to the Russian Museum, which we had missed on our two previous trips. 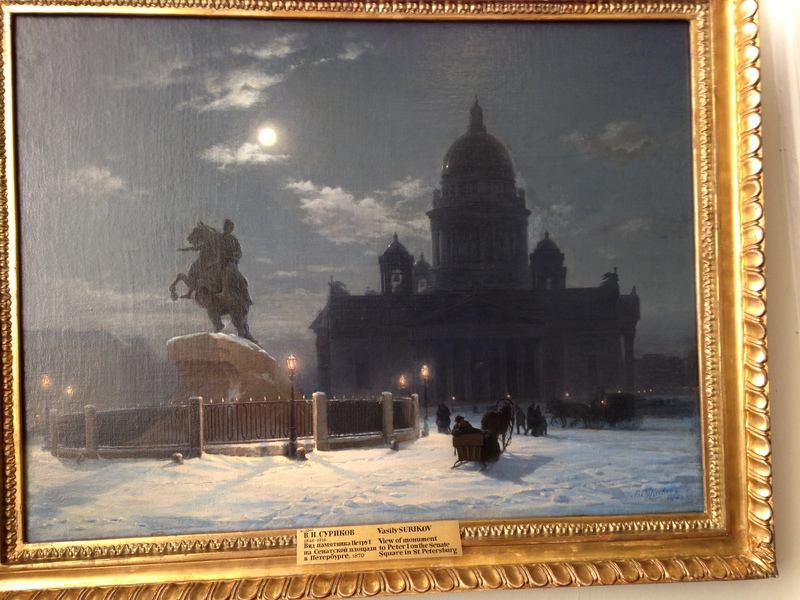 Here, all the art is done by Russians (hence the name of the museum) down through the centuries, and some of it is quite stunning. It re-confirmed my belief that the Russian people have a rich heritage of emotion and passion that runs deep in their history. Look at their art work, listen to their music, read their literature and you cannot help but feel hearts beating with tenderness and pathos. The next exhibit we visited, also in St. Petersburg, was a traveling Vincent Van Gogh exhibit called Van Gogh Alive. (You can google this exhibit to see where it’s been, how it was put together, and other interesting facts about it.) 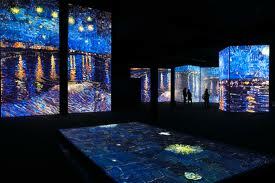 Although it contains no original artwork of Van Gogh’s, the digital photographic images are excellent, and the way they are projected onto the blackened walls – along with text from the artist’s own journals – makes the display very intriguing, along with a classical music score playing in the background to enhance the experience. You can sit in beanbag chairs on the floor and stare at the works of Van Gogh for as long as you like, then watch them flash across the walls to the next display of his genius, with the music playing appropriately all over the room. Van Gogh was a troubled soul, as almost everyone who knows anything about the art world is aware of. Although he is thought of today as the greatest Dutch painter after Rembrandt, during his lifetime he was virtually unknown and sold only one of his pieces for money. He struggled with mental illness and depression all of his life, which seems to me to be extremely relevant today considering the recent death of actor/comedian Robin Williams, who, despite seeming to have “everything” that money and success can buy, took his own life out of the pit of the depression which he could not seem to remove himself. Like Robin Williams, Van Gogh was an artist in his field, creative, stimulating and stimulated, and, in the end, again like Williams, chose to end his own life (with a self-inflicted gunshot wound). I watched Van Gogh’s artwork stream by on the dark walls of the tent we were in, amazed at the talent and emotion of this troubled man. Knowing what we know now about mental illness and depression, could he have been helped? Maybe yes, maybe no, given Williams’ fate. Even modern medicine cannot save everyone. But the Van Gogh Alive exhibit was a wonder to behold, different from most exhibits in its presentation and style, and one that I’m glad we took the time to see in St. Petersburg. Our last exhibit was in Riga, Latvia. Now, if ever there was a troubled country and city, this is it. Occupied by the Russians and the Germans over and over again, a beautiful little city that is walkable because of its size, designed with parks everywhere, pleasing to the eye and enjoyable beyond measure, it was an unexpected treat to spend two days here at the end of our Russian trip. And an outing to the Museum of Occupation was something we were encouraged to do, to explore this landmark exhibit of the history of Riga and Latvia during World War II. Little did I know how emotional this visit was going to be. Latvia was occupied twice during the war by the Germans, and twice by the Russians. In fact, in one of the display cabinets was the story of a Latvian farm couple who were told by their German soldier “guests” to pack up and get out quickly, as the Russian troops were moving into the area in a matter of days. The German officer said to his host family, “If you think we Germans are bad, wait until you experience the Russians!” And indeed, it’s up for grabs as to which country – Germany or Russia – is considered the cruelest in the history of Latvia’s 20th century memories. At the end of the war, there were only about 1,000 Jews left in the entire country. Thousands more had been “eliminated” along with dissenting Latvians. Man’s inhumanity to man was clearly on display in this museum, which broke your heart to tour. Words failed us as we came out into the sunshine after a two-hour walk through the displays and the evidence of what had gone on Latvia and Riga years ago. 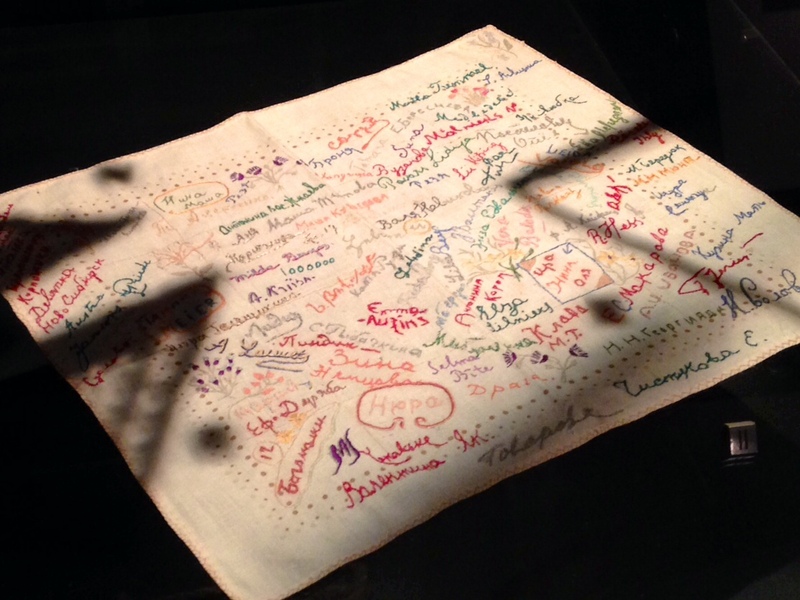 The photograph on the far right is that of a piece of cloth upon which a Latvian woman in a German concentration camp had embroidered the names of all the people in her cabin, so that they wouldn’t be forgotten. To see that piece of cloth in the cabinet, knowing that everyone named would soon die, was heartbreaking and powerfully emotional. Pictures at an exhibition. Telling stories that trace the history and life of people and places. It’s one of the things that is almost imperative to do when you travel, and it pays in not only fascinating information but emotional experiences that stay with you for a long, long time. What will be on exhibit in St. Petersburg and Riga ten years from now? The story of the downed Malaysia flight over the Ukraine? The final outcome of the situation in Iraq? No one knows for sure. But exhibits are a window into what we are concerned with, what breaks our hearts, and what touches us on a deep level. So when you travel, be sure to see an exhibit that would be meaningful to you. You won’t regret it.